Occupational Health and Safety (O.S.H) is a multidisciplinary field concerned with safety, health and the welfare of people at work. Its main purpose is to protect workers from health and safety hazards on the job and establish procedures for dealing with these hazards. The O.S.H Act ensures safety and health in industrial establishments and failure to comply with these may lead to fining and imprisonment. Hazards are sources or situations with a potential for harm, in terms of human injury, illness or both. Hazards may be classified as; psychological, electrical, ergonomic, physical and chemical, just to name a few. Jumanji is an American fantasy adventure comedy film and it is about four teenagers who were absorbed by a video game called ‘Jumanji’. This is a magical game and the only way for them to stay alive and escape the game is, fulfilling a quest and work together, while doing so. This movie is full of risks and hazards. Our group ‘The Hazards’ has chosen to evaluate these hazards presented in the movie, as well as give recommendations. A biological hazard refers to the biological substances that pose a threat to the health of humans and other living organisms. The game ‘Jumanji’ was situated in the jungle and this is an area full of bacteria, mold, diseases, parasites etc. in the first instance, an insect bit one of the characters (Dr. Smolder) and this could have caused him to become ill, since he was not sure of the type of insect and the traits it carries. Additionally, in the jungle there were dangerous exotic plants. Having direct contact with these plants could lead to skin rashes, allergies and severe illness, especially if the body has an open wound. Additionally, the individuals weren’t equipped with any personal protective equipment (PPE). Therefore, exposure to the various microorganisms that live in the plants and the jungle, could harm them. Recommendation– Personal protective equipment is important, necessary and should be administered. Some PPE may include, gloves, face mask, long sleeve clothing and eyewear protection. At the beginning of the movie the students were given detention. As punishment they were required to remove staples from magazines in a dark, dusty room in the basement. This can pose as a biological hazard as there may be mold and other potentially harmful fungi growing in the room as it was evident that it had not been cleaned in a long time. Recommendation- The students should have been given PPE in the form of gloves and masks to protect themselves from possible exposure. A Biological Hazard noticed in one of the first few scenes of Jumanji was that of Franklin Moose Finbar, a Zoologist, was seen defanging a snake. It is said that once a snake is defanged it is deemed as powerless. Though this may have been seen as a good idea, Mr. Finbar had not been wearing any Personal Protective Equipment (PPE). In the case he had lost grip of the snake’s mouth it could have bit and poisoned him, which could have even death. Recommendation- Mr. Finbar should have worn proper Personal Protective Equipment such as gloves to protect himself from the risk of being bit by the snake. A physical hazard is an agent, factor or circumstance that can cause harm with or without contact. The character, Ruby Roundhouse, was in a crop top and shorts. However stylish, this was not the appropriate outfit for the environment. There were many times where she was running through the bushes therefore her skin was not protected from potentially harmful plants. Also, the jungle poses as the perfect breeding ground for vectors such as mosquitoes so she can expose herself to diseases such as Dengue, malaria or the H1N1 virus. Also it was noted that she had no bag. Recommendation- Ruby round house can be dressed more appropriately this rendering her more protected against the harsh elements as well as be equipped with more equipment such as a First Aid kit and tent in case it rained while they were in Jumanji. In the build up of the movie Jumanji, the team trying to save Jumanji were in a helicopter attempting an escape into the next level. While flying the helicopter, the enemies shot a projectile which inflicted damage to the propellers which caused problems for the maneuvering and flight control of the helicopter. In this scene a serious safety hazard occurred where The Rock, acting as Dr. Bravestone decided to help the situation by hanging of the helicopter with the intention of fixing the flight control rod to the rotors. Though his intentions are good but this is a dangerous safety hazard. Recommendation- In the attempt to go fix that flight control rod, The Rock should have used a harness since he was clearly over 6ft of the ground in a moving helicopter. By using the harness, Dr. Bravestone would have had more freedom to nofix get the job done and could have completed the task faster, easier and safer. By doing this, the risk attached to this task would have decreased since a safer approach was used. As a form of punishment, the students were sent to a room to remove the staples from magazines so that they can be repurposed. However, this room and one exit, dim lighting, high shelves with a lot of items on them and generally a lot of clutter. This poses as a hazard because in case of an emergency, there is not a safe emergency route and the shelves can fall on them potentially crushing them. Recommendation- The shelving should be lower to reduce the chance of items falling in case of earthquake and the clutter should be cleared out more frequently to reduce trip and fall hazards incase persons are trying to evacuate quickly seeing that there is only one exit. Lastly, better lighting should be installed in the dark room. Psychological hazards are any hazard that affects the mental well-being of the worker by overwhelming individual coping mechanisms and impacting the worker’s ability to work in a healthy and safe manner. Within the first scene of Jumanji where they were sucked into the video game, the characters witnessed their friend being eaten by a hippopotamus. This could have cause a form of psychological trauma. After this had happened the character’s main concerns were that of whether they were going to die within the game. Recommendation: To aid in the avoidance of this risk occurring, persons should have been given gear that would have been able to the tranquilize the animals in the case that of it about to hurt them. The players advanced to level two, however, people on bikes were shooting at them and bombing them. This can be traumatic to the children because they basically entered a war zone and have never been in such a hostile environment and therefore develop PTSD. Recommendation: The students would have to see a counsellor afterwards to see if they have no long term effects such as PTSD or anxiety. 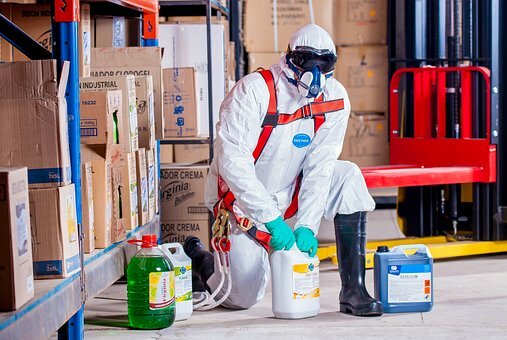 A chemical hazard is caused by the exposure of chemicals in the work environment, in which these chemicals can be detrimental. These chemical hazards pose a wide range of health and physical issues. Proper PPE should be worn or there should be measures put in place to prevent these hazards. In a scene, a bomb released smoke, fumes and possible chemicals in a public place. This could have caused serious damage to everyone as inhaling these fumes can have negative health repercussions, such as respiratory problems, as well as it could affect the eyes. A character, Van Belt, in his attempt to steal the diamond (Jaguar’s eye) encountered resistance from the four teenagers. In that scene, in order to make an escape, a bomb was thrown which exploded and released dangerous fumes and chemicals that could have caused encounters to become unconscious. Refer to figure 3. Also, medical issues such as lung disease or other respiratory problems could have aroused. Recommendation- The use of gas masks should have been utilized to prevent such from happening. Ergonomic hazards are physical conditions that may pose risk of injury to the musculoskeletal system, such as the muscles or ligaments of the lower back, tendons or nerves of the hands/wrists, or bones surrounding the knees. The students were sent to detention and one activity they were given was to take out the staples out of magazines. This can prove to be strenuous on the fingers and wrists. Recommendation- The students can be given a different form of punishment or they can have a designated break after some time so that they can relax their hands or do hand exercises. When Spencer was attempting to finish up Fridge’s assignment, he went up really close to the monitor and was sitting in a slouched position. This could put a strain on both his eyes and his back. Recommendation- He should adjust his seat by lowering it so he doesn’t slouch and sits squarely on his seat or make his desk taller. Not to mention, his chair does not give adequate back support so he should swap that out for a more supportive one. Also, he should put a safe distance of no closer than 20 inches between his face and the monitor. Below is an example of how to be seated correctly at a desk. An electrical hazard can be defined as a dangerous condition where a worker can make electrical contact with energized equipment or a conductor, and from which the person may sustain an injury from shock; and/or, there is potential for the worker to receive an arc flash burn, thermal burn, or blast injury. An electrical hazard was clearly displayed where Spencer attempted to stop the spark that occurred from the video game console by unplugging it. This could have led to death from being electrocuted since he did not use any safety gear. Another electrical hazard identified, was the scene where, the helicopter was damaged mid flight. Dr. Smolder Bravestone (Spencer) connected the flight control rod to the mesh plate under the radars which means he held onto the exposed wire on each end. Refer to figure 2. This could have resulted in an electric shock which could have been detrimental to Spencer. A situation like this could have easily been avoided if the exposed wire was connected to where it was supposed to be, before connecting the cables to the radar. Also, wearing the required personal protective equipment i.e. shockproof clothing, boots and gloves as mentioned in the Occupational Safety and Health Act section 23 part VI. Recommendation- According to the OSH Act (Electricity) Regulations 10 “Where one of the main conductors of a system is bare and uninsulated”, such as a bare return of a concentric system, no switch, fuse, or circuit-breaker shall be placed in that conductor, or in any conductor connected thereto, and the said conductor shall be earthed.